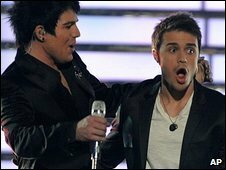 This year's American Idol finale drew its lowest ratings in the US since 2004, according to early figures. An estimated 28.8m viewers watched the two-hour show on Wednesday which saw 23-year-old student Kris Allen crowned the winner of the singing contest. The figure is down from the 32m who watched the finale last year, but the programme remains the most watched TV show in the US. A record number of almost 100m votes were cast by viewers this year. American Idol audiences have slipped to an average 26.3m per twice weekly episode over the five-month broadcast, compared to a 2006 high of about 30.8m. It comes despite producers adding a fourth judge, songwriter Kara DioGuardi, and slightly changing the format in a bid to keep the show fresh. The drop is now raising questions about the future of some of the show's key players. Judge Simon Cowell, who commutes weekly across the Atlantic while filming UK reality shows X Factor and Britain's Got Talent, has discussed leaving when his contract expires in May 2010. He has already said he would want to leave American Idol if it was toppled from its six-year reign at the top on US TV. The declining ratings reflect a general fall-off in US TV viewing in the past two years, which is being blamed on increased competition from computer games and the internet.